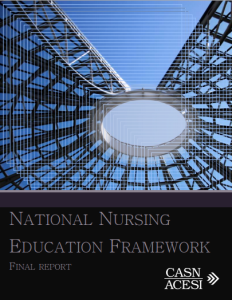 National Nursing Education Framework - Canadian Association of Schools of Nursing / Association canadienne des écoles de sciences infirmières (CASN / ACESI). Nursing education programs and delivery modalities have proliferated in Canada at both the undergraduate and graduate degree levels. Moreover, programs at entry and advanced levels are offered at institutions of higher learning and must meet general degree-level standards for quality assurance. In response to this evolution in nursing education, the Canadian Association of Schools of Nursing (CASN) has developed a national, consensus-based framework articulating core expectations for baccalaureate, master’s, and doctoral programs in nursing education. The goal in developing the framework was to capture the most salient elements for programs and graduates at each degree level, while simultaneously clarifying the expected progression from one level to the next.